The entire coast.willstare.com, stream.willstare.com, and willstare.com server infrastructure has been updated to a new dedicated host server. The virtual machines for coast and stream have been rebuilt on top of Debian 9 as well. This will allow them to stay up to date vs the old Ubuntu 12.04 and Debian 7 installs they were previously on. This entry was posted in Uncategorized on January 10, 2018 by will. I have created a demo virtual machine that will allow users to try out the system. It is fully functional, but will require a good deal of configuration change if you want to implement it in an environment using IP addresses not in the 10.x.x.x network. There is a readme that I highly recommend you read before using it. This entry was posted in bash scripting, Nginx-RTMP, Servers, Tutorials on December 1, 2014 by will. After working with Nginx-RTMP, I wanted to see how much traffic I could actually put through my server setup. I tried just streaming a bunch of video feeds from the server, but I ran out of processing power on my desktop. I had to figure out a better solution. Enter Flazr. Flazr is a Java application that allows you to, among other things, stress test an RTMP server. RTMP Stress tester – This is the machine running Flazr. I used an Atom computer running Ubuntu 14.04 server for my Flazr machine. It should run on anything that runs Java. For basic usage, just use the command line to initiate the test. Here’s an example of a configuration I used. The stream I was pulling was at 1500kbps. Here’s the bandwidth being used on the RTMP server. And here’s the CPU usage on the RTMP server. Obviously, my server can handle more than 100 connections. Let’s crank it up to 675! 675*1.5mbps = 975mbps.. That’s just about hitting the top end of gigabit. Before we do that, we should probably increase the heap size for Flazr. On Ubuntu, type nano cleint.sh to edit the script. Change -Xmx512m to -Xmx2048m (if you have at least 4gb of RAM in the machine). As you can see, RTMP streaming is very efficient. It only requires massive bandwidth. Even with 675 clients, the video was still smooth when viewing it from another machine. If you’re like me, you’ve got a shoutcast server configured to handle thousands of connections. I was pretty sure my setup could handle the load, but I wanted to actually find out. After looking around online, I found out an easy way to stress test the server using curl. Here’s a little script I wrote that will allow you to murder your server :D. Run this script on a test machine with a decent internet connection so you can really stress the server. This script should run on basically any linux operating system. I used Ubuntu as my test box. Just a few things before you run the script.. You will need vnstat (or you’ll have to comment it out) to get the most of the script. Also, be careful with how many threads you run. If your server has the ulimit too low, you could lock up the shoutcast server. Here’s an example of the script in action. There’s a few glitches (backspace might now work when entering stream URL), but I think its a good tool. This entry was posted in bash scripting, Servers, Shoutcast, Tutorials on December 1, 2014 by will. Fresh Debain 7 64 bit installation (no ‘web server’) or any other packages installed. DNS SERVER – It is highly recommended you have a local DNS server to handle requests to your server. This will allow the hard-coded URLs in wordpress and the script to continue working even if the IP addressing scheme changes. Everything can be done to a physical installation or a virtual machine. First we will install nginx-rtmp from a PPA. These steps are taken from HERE. – Note: This will depend on what version you have. As of this writing, nginx was at 1.2.1. Add the following to the add-modules configuration. Building the package may take a while. Great! Now we have nginx-rtmp installed on our Debian installation. Next, we will configure some stuff within Nginx! Start by changing nginx worker processes to 1. This is to make sure the streaming stats don’t get all screwy. Then scroll down and add the following to the end of the file. Save the file. Next we will make some directories and get some more files. Next we will edit some nginx settings. Next we will install PHP and MySQL. You might get 404 errors with the php PPA stuff.. It doesn’t officially support debian. Create a password for percona when it prompts. mysql -u root -p -e "create user 'wordpress'@'localhost' identified by 'PASSWORD';"
mysql -u root -p -e "grant all privileges on wordpress. * to 'wordpress'@'localhost';"
Great, now we have a sql database configured for wordpress! Okay, we are pretty much finished with nginx configuration! Time for installing and customizing WordPress! I assume that you will be able to install WordPress on the server. There are probably hundreds of guides on the internet explaining it. After installing it, you should be at your admin window. Follow THIS GUIDE I wrote earlier to customize WordPress for an RTMP frontend. 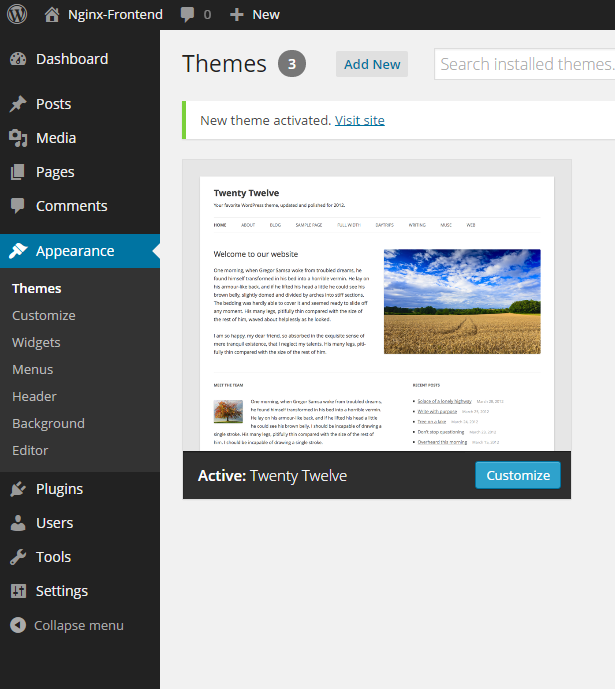 After configuring WordPress, we still need to add some more utilities and directories to the server. First we will create a directory to hold the scripts. These will be the heart of the server. Great, now we can add the scripts! First we will create the nginx_watcher script. This will listen for new RTMP streams, and then do some WordPress magic to create a user profile page with the stream information. Paste this script in. Make sure the IP/URL’s are correct. Nothing will work unless they are correctly configured. #MASTER contains a list of registered usernames for the event. To clear it, simply delete the file! #Creating the master list file. #Parsing the XML file to get all the handles/keys currently streaming. These should correspond with the usernames of the streamers. #The loop below cycles through the livestreams.list file and compares each line to the current master list. If it doesn't exist, it adds it to the master list. It also adds it to the list of things we need to add to the website. #Getting the existing post titles and ID's from WordPress. These will be compared to the currently active streams. #Loop to find names to add. If they don't exist, a new page is created for them. This will display at the top of the menu. It is currently empty at this stage. Also checks and makes a blog post that will feature recordings from the user. /usr/local/bin/wp --path=$WP_PATH post create --post_type=post --post_status=publish --post_title=$NEW" Recordings"
# ALL streams in the master_rtmp.list as often as the cronjob is executed. /usr/local/bin/wp --path=$WP_PATH post update $POST_ID --post_content="$RECORD_HTML"
/usr/local/bin/wp --path=$WP_PATH post update $ID --post_content="$LIVE_HTML"
/bin/echo "If this is your stream and it should be running, please contact an event administrator." >> $STREAM.deadtemplate.html #This string can be modified to meet your requirements. /usr/local/bin/wp --path=$WP_PATH post update $ID --post_content="$DEAD_HTML"
#CLEANUP to remove some temp files that we don't need. These could be converted into arrays at a later point, but it makes it very simple to use files/grep. #This last line is useful for logging. If you run this script as a cronjob and send the output to a log file, you will see when the last time the script ran. Then we will create the recording_watcher.sh script. This will check for new recordings, and if it finds any, it will process them and move them to the web server directory. From there, users can view them. #This script watches the /opt/ngnix_rtmp/live_recording directory for .flv files and converts them to .mp4 to make sharing the videos easier within a web browser. #List all files in the /opt/nginx_rtmp/live_recording directory that match .flv. It writes the list to the flash_vids.list file with the full path. #file currently open, it places the name of the file into the writing_vids.list file. #Loop below reads through the writing_vids.list file and cross references it to the flash_vids.list file. If there's a match, it removes the active file from the flash_vids.list file. #These files will not be processed in the next loop. #Sed strips the full path from the file names within the flash_vids.list file. #!!!!!!!!!!!!!!!!!! ENTER THE CORRECT PATH BELOW. SHOULD BE THE SAME AS RTMP_RECORD VARIABLE. THANK YOU !!!!!!!!!!!!!!!!!!!!!!!!!!! #from the filenames. At the end it removes the .flv file. #Cleanup. Move all .mp4 files to the /var/www/wordpress/rec/mp4/ directory, and deletes the flash_vids.list and writing_vids.list files. Save that file as well. Now you should have 2 scripts, nginx_watcher and recording_watcher. Now we need to assign some final permissions and ownerships, and create a cron job to run every 60 seconds. sudo -u www-data -s #change to the www-data user to add a cronjob. If all went well, you should now have a fully functional Nginx-RTMP + WordPress installation capable of handling streaming sources and clients. It should be able to record all streams running through it. If all else fails, leave a comment below. If you have a large event coming up and would like to use this for your streaming needs, please feel free to email me at coast.willstare [@] gmail.com. I can work with you to provide assistance, or even meet additional requirements. There may be errors in this guide. If you spot any, please leave a comment. Thanks! After taking a break from the project, I am back with version 2! The biggest change is that it is now based on a single Debian VM instead of 2 Ubuntu machines. Switching to a single VM will use less system resources and make iy much easier to implement on a single physical box. There is also a new feature: Recording! Now every stream is archived for later viewing, allowing tournaments and other events to be saved for later distribution. These recordings are incorporated into the WordPress site, and allow users to easily browse saved streams. I will begin a new series going over the installation and configuration of the Debian VM, and again will provide a download link for the finished product. If you have already implemented the dual-machine solution, I’d recommend you take a look at the single-machine setup. This entry was posted in Uncategorized on November 30, 2014 by will. I made 2 virtual machines (VMware workstation 8.0 compatable) that are ready for deployment in your LAN. You’ll want to run these on a decent ESXi or VMware workstation host with a 1gbps or higher connection. Just download these machines and import them. You’ll probably want to assign a static IP address to these before you send them into production. On the WordPress website you’ll want to change a few of the links to match up with your system’s IP addresses. Both VMs are running up to date (as of 2014-09-21) Ubuntu 14.04 64bit. The streaming server is set for 4 cores, so if your VM host only has a dual core you should adjust that. They require a combined 3gb of ram. They are fully configured, and WordPress is installed and customized exactly how the guide shows. These will work for logging into the operating system, mysql/phpmyadmin root account, and WordPress admin account (wpress database for the website will use a different password). Again, you should probably change these! This entry was posted in Uncategorized on September 21, 2014 by will. If you have been following these tutorials, you should now have a fully functional Nginx RTMP server as well as a WordPress site optimized for showing live streams. We just need to install a few more things and this project will be complete! The first package we need is wp-cli. This program will allow us to modify our WordPress site from the CLI! Cool! If it works, we can make it an executable so you just type “wp” to call it. That’s all we have to do to enable wp-cli. Next we need to install xmlstarlet, a utility to parse xml files. After that installs, we are finished adding software to the server. Everything else should be included in your distro. The script we will be using automatically generates .m3u playlist files that will need a directory in the webserver to reside. I like to use an ‘assets’ folder, but you can name it anything you’d like. Make a folder in the www root of your webserver, where WordPress is installed. After we create the folder, we must ‘chown’ it, which means change owner. Change ownership to the user that will be running the script. What follows is a custom script that will allow the WordPress site to update based on the status of the nginx RTMP server. It will require some input before you run it, but once its set it can take care of itself. #Loop to find names to add. If they don't exist, a new page is created for them. This will display at the top of the menu. It is currently empty at this stage. Create a folder in the home directory of the user that will be running the script. Inside that folder, create a new file. If all goes well, there will be no errors reported, and your WordPress site will have a new page set up for the stream. The live video should be playable through JWPlayer, and an m3u file will be available for download. You should also be able to stop the stream, run the script again, and the page will be updated to state the the stream is offline. The last step is to create a cronjob for this script to run every minute. This will allow users to begin streaming and a page for them will be created no more than 1 minute after. That will run the script every minute and send the output to a log file. After that, your Nginx-RTMP/WordPress Frankenstein should be ready to roll! 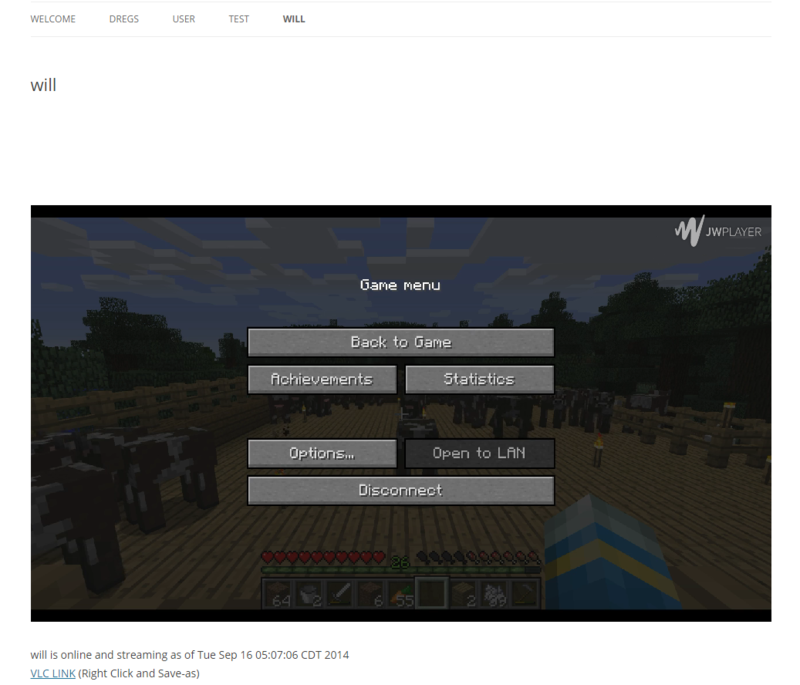 Screenshot of the webpage when someone is actively streaming. Screenshot of the webpage when that same person has stopped streaming. I plan on releasing some prebuilt virtual machines soon for download for those who just want to get something running. THEY’RE HERE! If you have any questsions, please leave a comment below. If you have any suggestions for the script, I’d love to hear them. Thanks for reading. This entry was posted in bash scripting, Nginx-RTMP, Servers, Tutorials, Ubuntu on September 21, 2014 by will. If you are following along in this mini-series, you should now have a fully functional nginx based RTMP server capable of receiving and broadcasting live video streams. As cool as that is, its not very user friendly, especially for potential viewers. In this post we will go over the steps to get a frontend set up for our RTMP server. This will serve as a central hub for our streaming environment. It will host information about how to watch the streams, how to broadcast to the server, as well as some cool statistics. You will need the following. Fully functional WordPress installation – This guide will not cover WordPress installation or configuration. There are dozens of quality guides on the internet for this. Basically you need an Ubuntu server running the LAMP stack. Log into your fully up to date WordPress installation via the web browser. I have found a few customization options that make the website look better for streaming. Change the theme to “TwentyTwelve”. Its a simple, clean theme that won’t distract viewers. Remove all widgets from the side panel. This will clean up the pages even more. Removing the “meta” widget will remove the “login” link on the side of pages. To login in the future, you will have to go to your WordPress admin URL (ex. 10.0.0.242/wp-admin) . Create a menu via the Appearance menu. 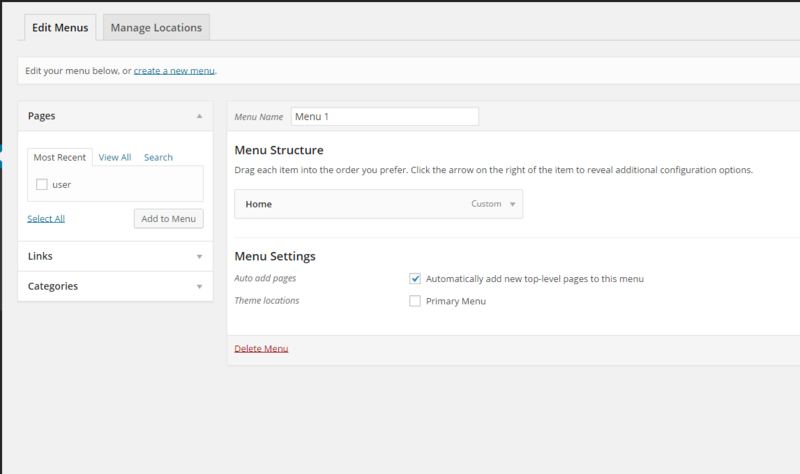 In the menu options, click the checkbox for “Automatically add new top-level pages to this menu”. Also select Primary Menu. This will automatically make our links on the website when the script makes new pages. Create some informational pages for your viewers/streamers to learn about how to use the website to stream/watch streams. Here’s some screenshots of mine. A basic how-to guide on streaming to the RTMP server with OBS. 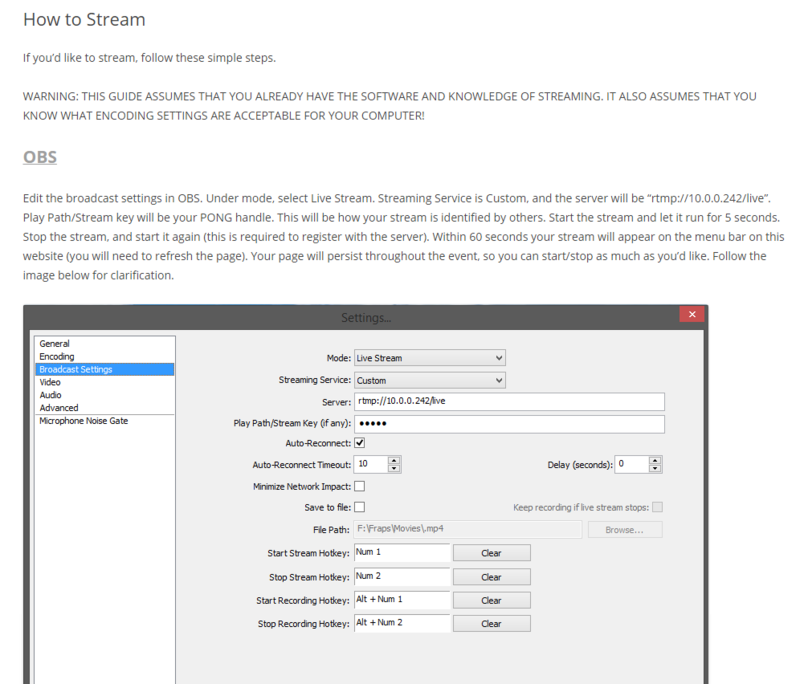 This page also includes directions for Xsplit as well. 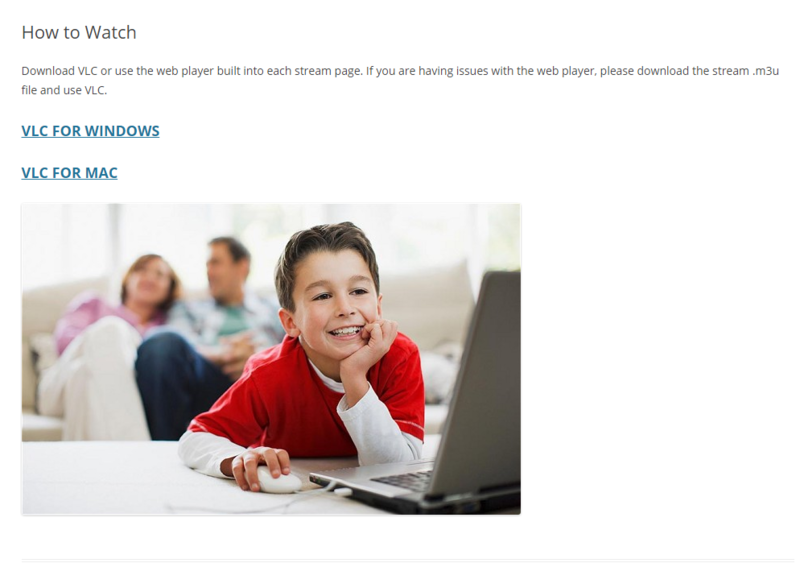 A basic how to watch page with download links for VLC. This entry was posted in bash scripting, Game Servers, Nginx-RTMP, Servers, Tutorials, Ubuntu on September 12, 2014 by will. For this guide I am following this post. For this guide you will need an up to date Ubuntu Server 14.04 virtual or physical machine. This will download updates for all the installed software. When that finishes, we need to grab the dependencies for nginx. Type or paste the following into the server. Now that we have the dependencies, we can download the source code of nginx from their webpage. As of this post, the most recent version is 1.7.4. To download it, type the following. We also need to grab the RTMP module because it isn’t included in the main nginx distribution. Before we continue, we need to install the unzip program. Now we open the archives we downloaded and get cracking! We can now configure the source and build the binary. We are almost done. To add RTMP functionality, we must enable it in the nginx configuration file. Paste this in at the end of the file. To save, hit Crtl+x , yes, and enter. To make the rest of the project easier, we should make nginx into a system service that runs automatically and can be controlled with the service command. We can now start and stop nginx with the sudo service nginx start | stop | restart commands. Yes! It will also start when the server boots, so you don’t need to worry about that. Next we need to go back to the nginx configuration file and prepare it for stats delivery. The ability to display server statistics will be crucial to this project. This page will ensure that live streams have the correct pages generated for them. Go back to the nginx configuration and add the following inside the server directive in the /usr/local/nginx/conf/nginx.conf. We have to do one more quick thing before the stats page will work. In order to generate the XML, the RTMP module uses an XSL file. This will need to be placed in the HTML root of the nginx server. Create a file called stat.xsl containing the following. Save it, and we should be good to go. For whatever reason, pasting the stat.xsl file into this page is messing things up, so I’ll just include a link to the file. After you paste that in, save the nginx configuration. Restart the entire server. After it boots should be able to see the rtmp server stats if you go to your server IP address /viewers. And that’s it for the nginx-rtmp installation/configuration. The server is now running and ready for the next section of this series… Web server configuration and scripting! This entry was posted in bash scripting, Nginx-RTMP, Servers, Tutorials on September 9, 2014 by will.